The Summer has been humming along and no where more so than on Plum and Pilot. Today I noticed an interesting item that makes a post seem appropriate as the activities on Plum have changed since the '60s. The Islands are now under the management of US Fish & Wildlife as part of Green Bay National Wildlife Refuge . I saw an interesting post on Facebook from Rick Heineman who has established a Facebook Page on Washington Island History. True, this refers to the Coast Guard presence on Washington Island but it reminds me of how much time that Plum was "on its own" so to speak. The Coast Guard left Plum around 1990. Fast forward to Spring 2015 and the announcement that activity will be resuming after about a 25 year break. The project even has a new boat. It is most likely smaller than those of the Coast Guard but it is seaworthy and has been very busy helping, transporting, and toting! What is an Island without a boat? From years of sailing, I have a few photos of gulls on similar posts but that is for another time. So when I saw this one on the Friends of Plum & Pilot (FOPPI) Facebook page it reminded me of how far these islands have come. "No" doesn't quite fit anymore. Oh, we do have to be careful how we get to Plum. Due to the precarious nature of the dock, travel by kayak, canoe, and dinghies is welcome. On special event days, area charter companies have provided transportation to allow more people to taken the hiking trails and learn more about this place. Numerous volunteer work days have been held since May. Private contractors and USFWS personnel have spent time stabilizing the buildings as well. One of these special events, the Annual Volunteer Picnic and yearly Meeting was held on Plum in July. Here Steve Lenz, Horicon Leopold Complex manager addresses the group. Also in July, a student archeological team headed by US Fish and Wildlife Regional Historic Officer James Myster and Hamline University Anthropology Chair Brian Hoffman returned for the third year. Work continued to find out more about the original lighthouse. Yes, more artifacts were discovered. On another part of Plum, FOPPI continues to work on the renovation of the dock. 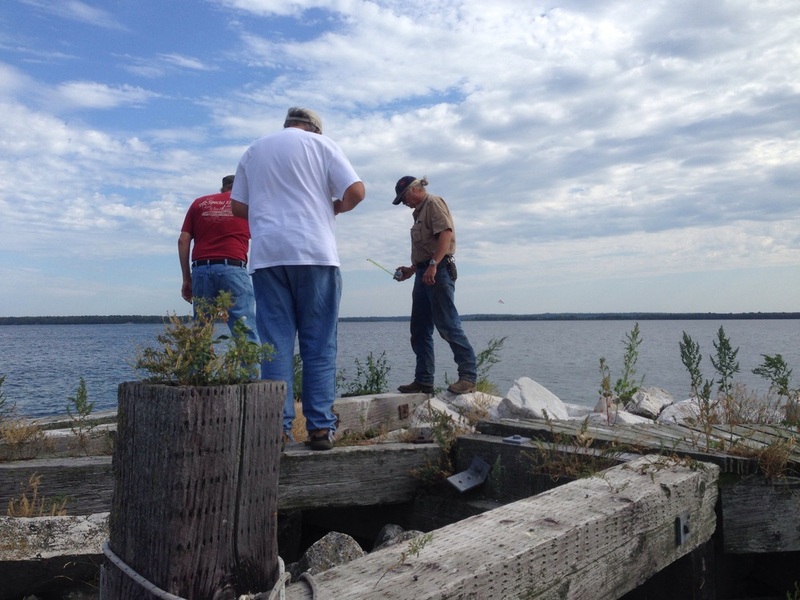 Work on the dock is critical to the future public access of Plum. This volunteer group is searching for grant opportunities and developing proposals based on professional evaluation. Mother Nature, in these past years, has left much to do. 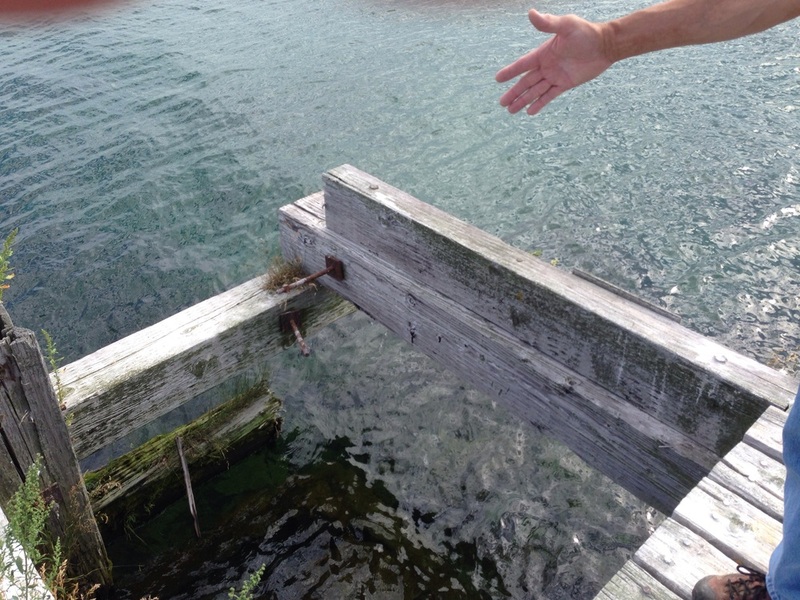 Did I mention the dock is precarious? In closing, there is one more Open Access Day coming up this Saturday, August 22. Come visit during daylight hours. Lets hope for fair weather and little to no winds. Besides quiet craft entry, local charters will be offering trips out to Plum that day. See the FOPPI website (plumandpilot.org) for further information. Representatives of FOPPI and USFWS will be on Plum to share the history of this place, lead hikes, etc. Bring your own food. ( A camera would be good, too.) Pack it in & pack it out is the rule.